ROSEMARY HARRIS: Barbeques, pool openings, Memorial Day is filled with those activities. It's the unofficial start of the summer season - blockbuster movies and the smell of Coppertone. Of course, it's more than that. Today, I'm thinking of a man I never met. I became aware of him when I was about eight years old. I remember asking my mother why her youngest sister - certainly the most beautiful of all the DeMaria girls - had never married. She told me Aunt Jenny's fiance had died in The War. I went back to whatever I was doing (making mudpies...tormenting my sister..)and didn't think much about it until I was a bit older and bothered to ask a few questions. Jenny DeMaria and Henry Marino grew up on Adelphi Street in Brooklyn. In the same way everyone in the working-class Italian community seemed to know that my father and mother would marry everyone knew that Henry and Jenny were destined to be together. Except they weren't. As a teen my cousins and I thought it terribly romantic that our aunt was still pining for her lost love. She never married. In my twenties, I thought it neurotic. Now it makes me think of all the friends and family members forever changed by the casualties of war. All wars. All nations. This is a beautiful reading of one of the most famous poems of World War 1, In Flanders Fields. It always reminds me of how much some of us have given. HANK: Thanks, RO. I can't hear that without crying. My mother used to talk about the gold stars that appeared on her high school walls one by one, day after day...indicating another classmate had been killed in World War II. LUCY BURDETTE: Hats off to all the folks who lost their lives trying to protect what they loved. I have never seen anything so sad as the cemeteries in Normandy. I know that war changed my father permanently...he kept in touch with his WWII buddies right up until the last months of his life. HALLIE EPHRON: We take so much for granted, like the people who put their lives on the line every day for the rest of us. We have many friends who served in the Vietnam War. Fortunately they all came back; all of them were changed. DEBORAH CROMBIE: I'm all for picnics and flag flying, but it doesn't seem to have much to do with honoring those fallen in war. 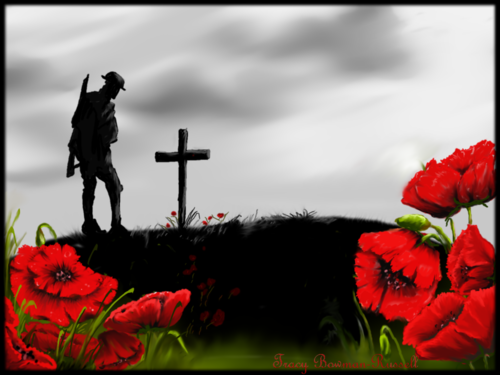 In the UK and Commonwealth countries, they celebrate Remembrance Day on November 11th, the official date of the end of WWI. Poppies are worn by young and old for weeks in advance, and poppy wreaths are placed on all the war memorials. On that day, there is a two minute silence at eleven o'clock. It's very moving, and makes the loss seem very real. "You see them in long-range photos on the evening news and old black-and white pictures in books about Vietnam. They are iconic; the woman in a black dress, her heels sinking into the dirt that always seems softer around anew grave. The man in front of her is wearing a uniform so starched and polished you feel you could cut your fingers on the crease of his trousers, or be blinded by the sun off his brass. He is handing her an American flag, tightly folded so that only the blue star-spangled field shows. The other details vary: there may be a trumpeter, or a rifle volley. There may be four planes overhead, one arching away, lost in the sky. There may be motorcycle-riding angels and protestors. But there is always, always the uniformed man. And the woman. And the flag. Mine is on an old chest of drawers in my bedroom." Although it is certainly fitting that on this day we pause to remember those who have given so much, somehow one moment’s thought hardly seems sufficient . . . we are obligated to both honor and remember the sacrifices made by those who serve. We owe them that . . . and so much more. Today, as always, we will proudly fly our flag and we’ll say a prayer for all those who have given their lives for the sake of others . . . .
My Dad spent World War II writing press releases for the U.S. Army, and my polio-bent spine kept me out of Vietnam. But on Memorial Day -- and many other times during any one year -- I think of my young friends Billy and Pete. Billy was the trouble-maker, always pushing limits to do something fun. Pete was the opposite, early college graduate, President of his fraternity, always keeping us in line. Both died in Vietnam. Julia's scene is so perfect because it's what I remember of the funerals -- a wife and a mother being handed a flag to cuddle instead. Many of us are very lucky. My son-in-law is in Afghanistan right now. Memorial Day is bittersweet for us, until he is safely back with our daughter Stateside. Yesterday, I was part of one of the best Memorial Day events I have ever attended. Friends own a farm in rural Kentucky that includes a tiny cemetery. Buried there is a black Civil War veteran and his family. My friends contacted this man's living family members and invited them for a ceremony. My friend's husband installed a black star on the vet's grave, and gave a very moving speech about the role of Kentucky in the war, how the black slaves ended up taking part, and some of the events. Then he told of the origin of how the song Taps became associated with military funerals, and cued a trumpet player hidden in the woods to play a wonderful and moving rendition. Afterwards, we all had barbecue together alongside the Licking River, and looked at a wonderful family geneaology one of the family members put together. One of the coolest things was that two different branches of the family met there for the first time, even though they all live in Cincinnati, an hour away. Uncle Edward died in Europe in April of 1945, and is buried there. Uncle Robert was also in the infantry in Europe, my father was in the South Pacific -- a Marine, and Uncle Charles was a Merchant Marine. I do honor their service, and I grieve for the uncle I never met. But I continue to wonder why we have not developed a better way to solve disputes than sending our young people to die. I happened to be in London for Remembrance Day in 2000. It was a Sunday and my mother-in-law and I went to church at St Paul's. Soldiers marched in and took their places in the pews set aside for them. We participated in the familiar service (we're Episcopalians) and sat through the two minute silence that was so moving. Back home it is so different! Memorial Day means holiday, store sales, pool openings to most people. People wish each other a happy Memorial Day which makes no sense to me. Happy dead soldiers day? Sorry. One of my rants. Too many of us are simply too damn ignorant when it comes to patriotism, honor, and respect. I'm calm again... I do think today is a lovely day to get together with family and friends and share a meal. My family has been lucky in that all my uncles, grandparents, and cousins who have served in war and peace time have come home safe. They only talked about their buddies or shared funny anecdotes, never about the discomforts and horrors. My father, who served in the peacetime Navy,would never identify himself as a veteran, because he didn't share the wartime risks of his older brothers and friends. So I honor all those who gave their lives, all who survived but suffered in wartime, and those like my dad who stood ready in time of peace. And I, too, wish we could find a better way. Pat, I so agree. "Happy Memorial Day" seems like such an odd combination of sentiments. My Choctaw grandfather fought in WWI. My uncles fought in WWII and Korea. My father fought in WWII, Korea, and Vietnam. My late first husband fought in Vietnam, as did my brother and cousin and two lovers (before I met my first husband). I lost friends and classmates in Vietnam. And my son is a veteran of the Gulf War. I have the greatest respect for our men and women who have served their country on the field of battle or in support of that, whether I have agreed with the wars or not. I hate to see our veterans today neglected with the programs they and their families need cut. Let us all agree on this--if they've served, they deserve our respect, our thanks, and our support when they return. While we often spent the day participating in a neighborhood block party, or camping out with family friends, my dad made sure my brother and I understood the true meaning and importance of Memorial Day. Both grandfathers fought in WWI, and the life of Dad's Uncle Sam was cut short by mustard gas. Grandpa Caldwell (a Seabee) became a career navy man and died on active duty in his 60s. Dad fought in the Pacific Theater, sustaining injuries when a shell exploded near him aboard ship. His left eardrum was punctured, permanently damaging his hearing and causing him severe pain whenever he flew for the rest of his life. He also carried a piece of shrapnel in his shoulder from the explosion of the shell. It was close enough to the surface that we could see part of it, but like an iceberg, most of it was buried deeper in his flesh and it throbbed according to changes in barometric pressure. 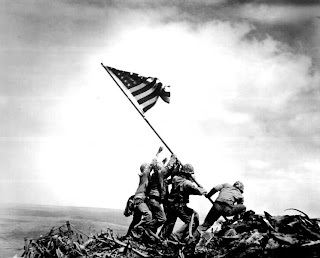 Uncle Bob was the only survivor out of five men when their foxhole took a direct hit during the Battle of Iwo Jima. I have a photograph of him taken shortly afterward, and it shows a desperately haunted man. He recovered physically and went on to become a career Marine, serving in Korea and being mobilized during the Cuban missile crisis. He married, became a father and grandfather who delighted in his family and had a good life, but his eyes always had that haunted look. In my generation two cousins, a sailor and a Marine, served in Vietnam (and the Marine who served in country died at 52 of brain cancer). My dear brother-in-law served as a medic with the Air Force, and to this day cannot bring himself to talk of his experiences. So while my husband and I are enjoying our meal tonight, I've already given thought and thanks to these and the millions of others who've sacrificed so much in service to our country. And just in case you're interested in showing your support for our currently serving troops, here are two websites that are available year 'round. Green Beans Coffee is one of my favorites with their motto: "Honor First. Coffee Second." You can give anything from one cup of coffee to an entire bag. It can be sent where it's most needed, or to your own Joe ("Cup of Joe for a Joe."). Tea's included too. Good stuff. Give 2 the Troops has a HUGE variety of items to choose from, everything from Chapstick, phone cards and items for their K-9 companions (chew sticks, toys, shampoo) to microwave ovens, musical instruments, K-Cups, Keurig machines and everything imaginable in between. Also, whenever I see someone wearing an item (usually a jacket or ball cap) that indicates they're a veteran, if the situation warrants it, I introduce myself and thank them for their sacrifices and their service. If they appear to be of an age to have served in WWII or Korea I'll mention my dad's and uncle's service. It opens up the moment and invites them to discuss their experiences if they care to. Listening with respect and genuine interest is a gift we both benefit from. For both veterans and currently serving forces, I ask if I could please pay for their meals if we're in a restaurant, telling them it'd be my honor. Even if it's just a cup of coffee in an airport, or a souvenir at a ballpark (that was really fun! ), it's a simple way to express heartfelt gratitude. I like what Deborah Crombie wrote. I think there should be more reverence, something to make what the day is about more real. It seems the U.K and the other countries have the right idea.